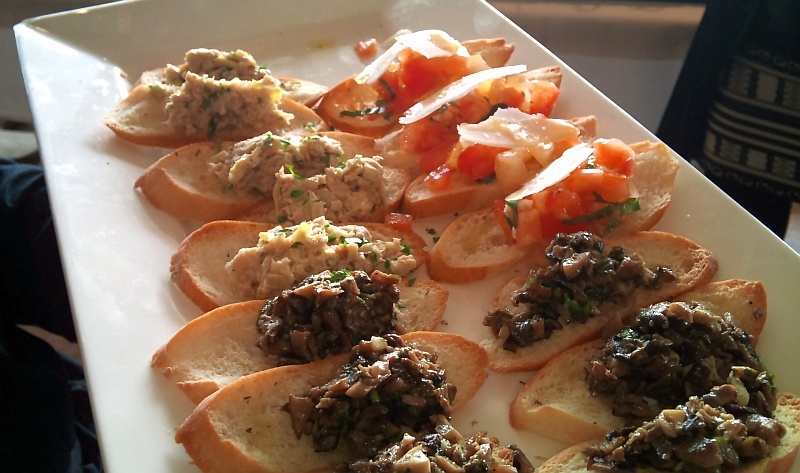 In Spain, small plates of food are known as Tapas. In Italy they also have small plates, but the name is different: Cicchetti. Whether you prefer to say Cicchetti or Tapas, the food at Nicli’s Next Door is very good and they have an excellent wine list! 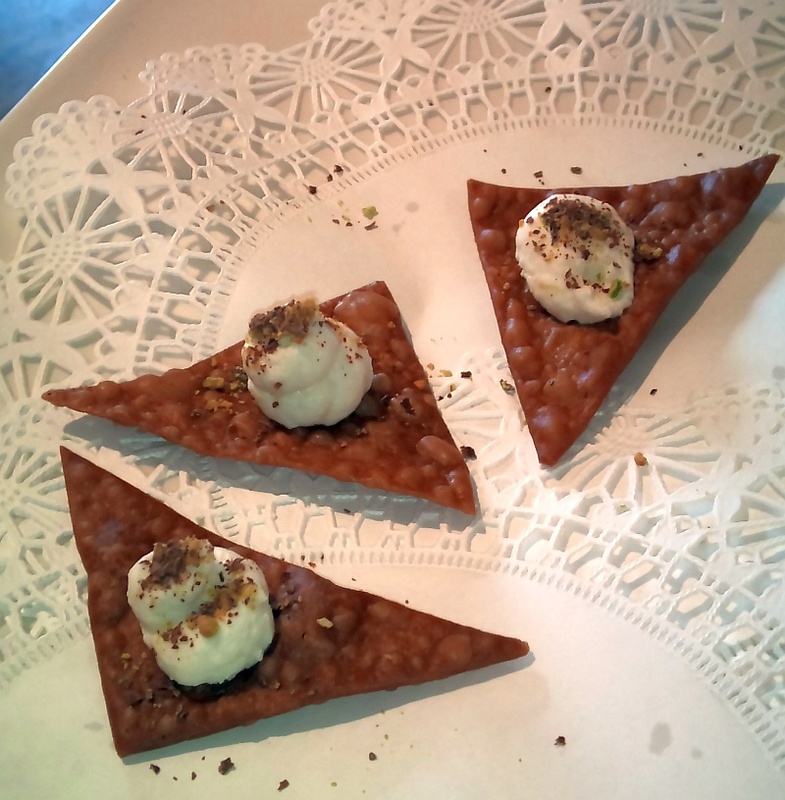 I was invited with a group of other food writers to try out Nicli’s Next Door, which is next door to Nicli Antica Pizzeria (at 62 E Cordova Street, Vancouver). Nicli’s Next Door was conceived as a place for a small snack or drink, while you waited for a table to open at Nicli Antica Pizzeria, but the chefs, David Tozer and Keev Mah, really produced some fantastic Italian and Italian-inspired dishes, going beyond the small snack, so now you can enjoy a great meal with shared plates with your family or friends. I enjoyed all the dishes. 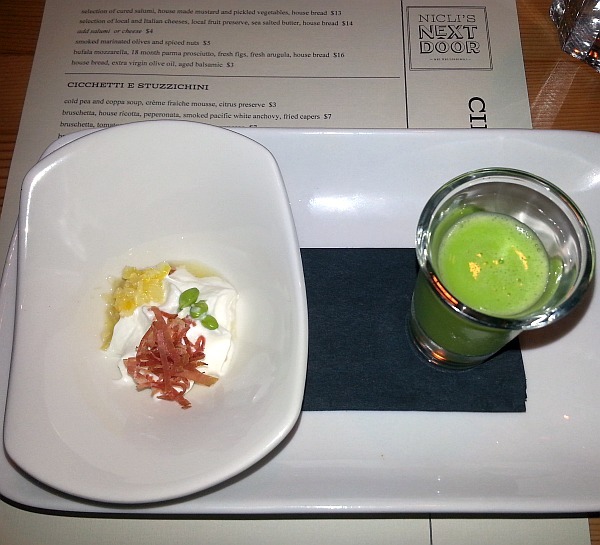 The cold pea and coppa soup, came with the cold pea puree and the creme fraiche mousse separately which you mixed together. Lovely citrus zing and lightness to this cold soup. The bread that came with some of the dishes, btw, is all baked in-house. It was all nice and crunchy. 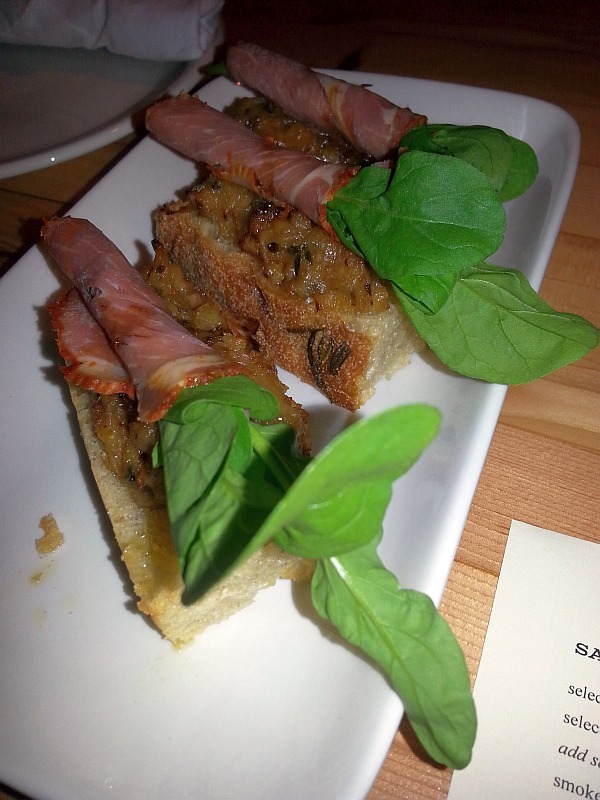 The bruschetta had a leek jam that was so full of flavour together with nice smokiness from the bacon. 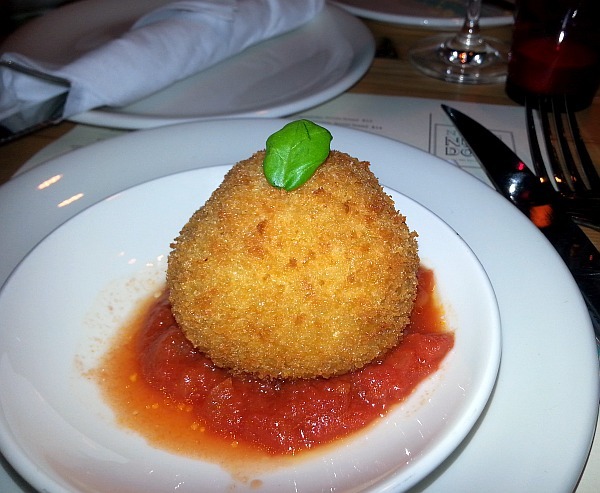 The arancini was quite large, and could almost be a meal in itself for small eaters. The pork ragu inside the arancini was full of savoury flavour. One of my favourite dishes. 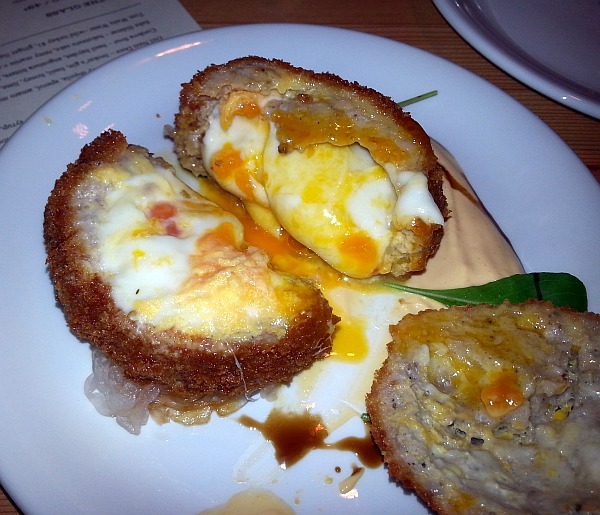 The “Not Scotch Egg” was a play on scotch egg, with Italian ingredients. The egg part, really had an egg yolk in the middle, but around it was wrapped the fior di latte. So you had cheesey, creamy goodness, together with the egg yolk and the seasonings from the Italian sausage. 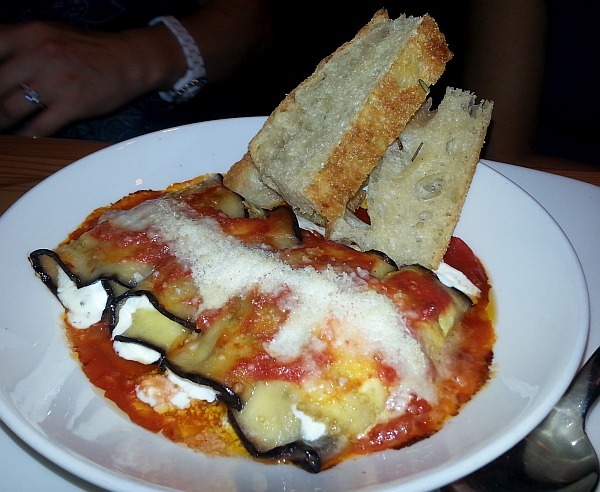 A bit larger plate was the eggplant involtini, which had a thin slice of eggplant wrapped around the ricotta cheese, and served with the San Marzano tomato sauce and the lemon and thyme spices. This dish was light, fluffy and creamy. An elegant dish. 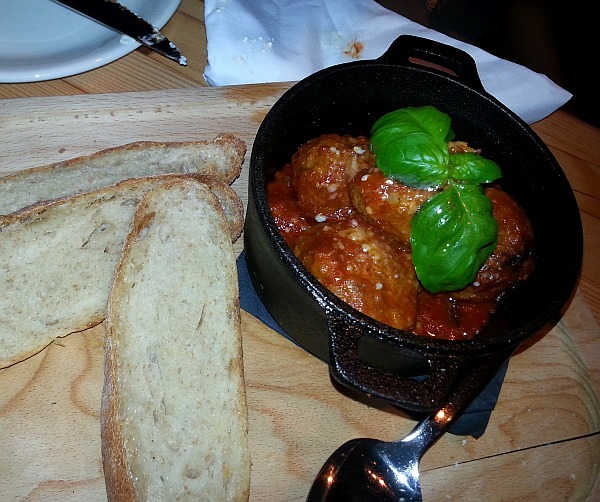 More savoury goodness from the braised meatballs (made with beef and pork), with the Marinara sauce and house bread. 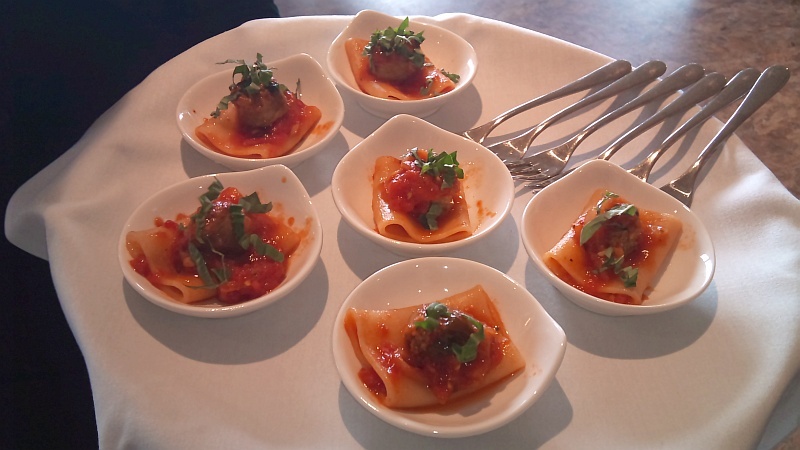 I liked the fennel in the meatballs and the bright flavour from the Marinara sauce. 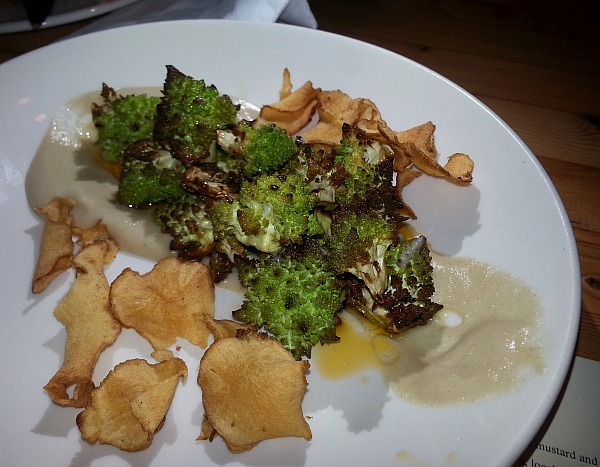 For a bit more vegetables we tried the roasted Romanesco and Sunchoke puree, and sunchoke chips. A Romanesco is a vegetable that is a cross between cauliflower and broccoli. Our last dish was the reginette with pork ragu napoletana. Reginette are strips of pasta with wavy edges. To this you add a nice pork ragu sauce, and enjoy. 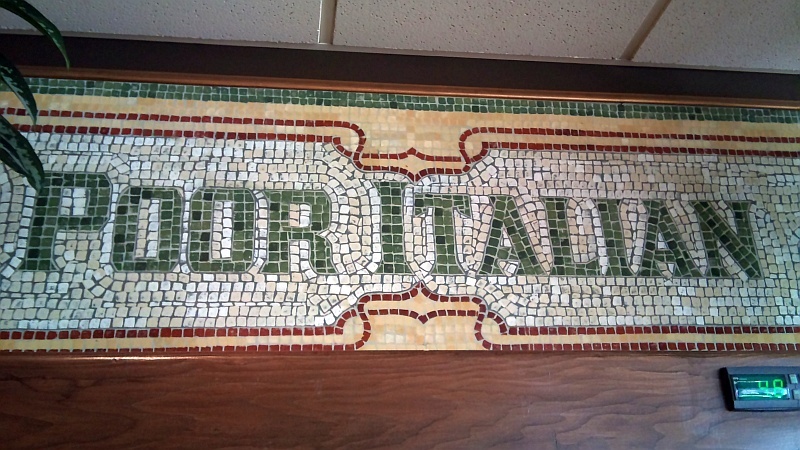 I mentioned that Nicli’s Next Door has a very nice selection of wines, all by the glass, and all Italian. For some at our table, the short wine list was a bit intimidating, but the list is broken down into a few categories to help you choose: Rustic, Lively, Elegant, Complex, Rose, Sparkling, and House. 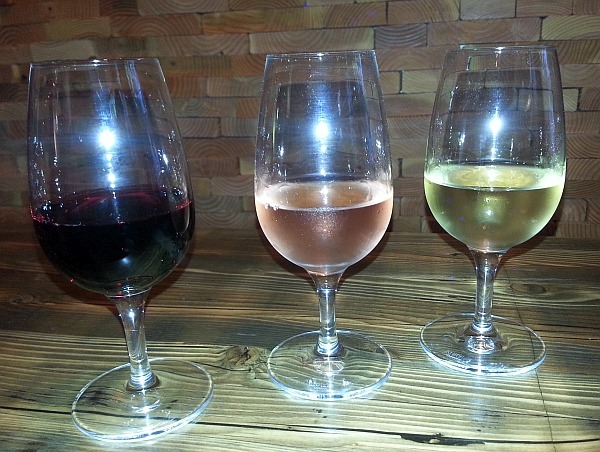 If you can’t make a choice, they also have 3 different flights of wine you can try, with each flight having 3 different wines. 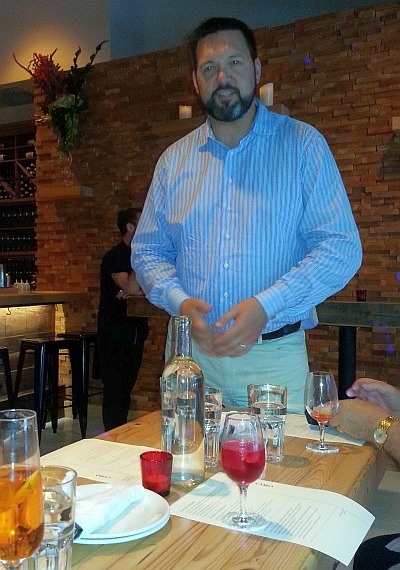 I had a glass of the “Elegant” Brancaia Tre Sangiovese blend di Toscana. I chose it as it would be lighter bodied with a good balance of acidity and fruit flavours, and soft tannins, which should pair nicely with most Italian dishes at the restaurant, and I was right. Enjoy! Do you like cooking, or watching people cook, then eat? I like both and was happy to see that YEW seafood + bar and La Quercia will be offering cooking classes in association with the Arts Club Theatre Company. In addition, if you are a wine person like me, Mission Hill Family Estate will be providing the wine. Eat and drink local! Here is the announcement from the Arts Club Theatre Company. Enjoy! 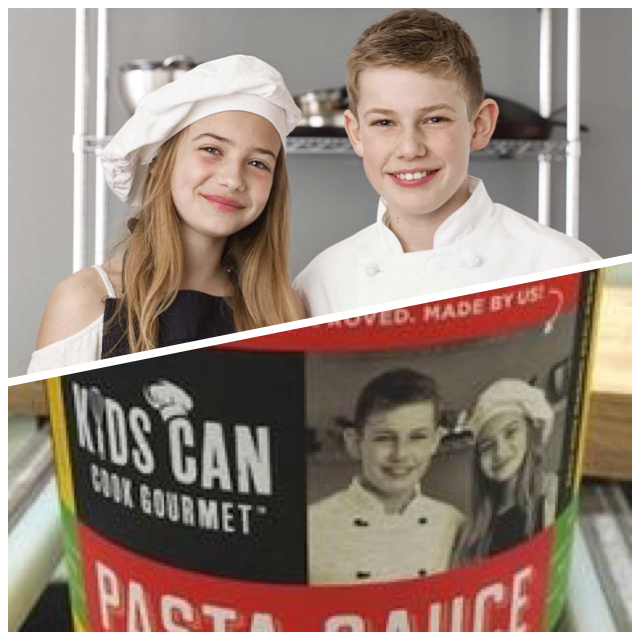 Vancouver, B.C.—The Arts Club Theatre Company’s duo of July Celebrity Chef Cooking Classes will showcase sumptuous summer fare and fine B.C. wine. Top chefs from YEW seafood + bar and La Quercia move from the kitchen to the patio to demonstrate how to prepare refined menus with distinct themes. The first evening is dedicated to the art of the barbecue, and the second to delectable Northern Italian cuisine. The popular fundraising classes are held in private luxury homes in Vancouver and West Vancouver. Sean Murray of YEW seafood + bar takes on grill master duties on Tuesday, July 23, to throw an elegant backyard party, featuring four courses served family style. The class will focus on professional tips and tricks for firing up the barbecue as well as interactive demonstrations on salad and dessert preparations. Murray has spent his career creating high-end dishes with an accent on local seafood. On Wednesday, July 31, Lucais Syme of La Quercia will create a rustic, regional Italian menu with a contemporary edge. 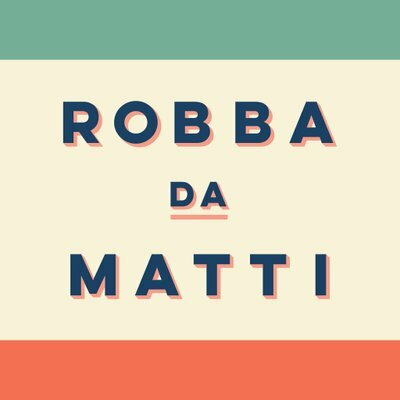 His Kitsilano trattoria has built a reputation for updating traditional dishes and embracing the farm-to-table movement—recent accolades include Best Casual Dining Award fromVancouver Magazine and Best Italian Golden Plate Award from the Georgia Straight. The class will begin with an olive oil tasting by Kelowna-based The Olive Oil Merchant, which specializes in importing superior quality olive oil from artisan producers in Italy. Wine pairings for each dinner are provided by Mission Hill Family Estate, producing award-winning wines in the heart of British Columbia’s pristine Okanagan Valley, one of the world’s most exciting wine regions. Both classes start at 6 PM and tickets are $125 each (with $50 tax receipt). IN BRIEF: The Arts Club Theatre Company hosts summer Celebrity Chef Cooking Classes with Sean Murray of YEW seafood + bar on July 23 and Lucais Syme of La Quercia on July 31. 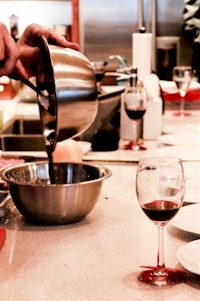 Each evening features an interactive cooking demonstration of summer fare, served with wine pairings and held at private Vancouver area homes. For tickets, call Special Events at 604.687.5315, ext. 248, or visit artsclub.com. Since graduating from culinary school, Sean Murray has honed his skills in the kitchens of luxury hotels. He trained for five years under Ernst Dorfler at the Pan Pacific Hotel in Vancouver. Murray joined the Four Seasons Hotel group in 2002, spending six years in various international hotels and resorts, with his most recent position as executive sous chef at the Four Seasons Costa Rica. 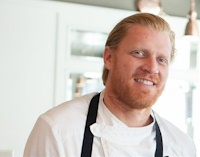 Murray returned to Vancouver in 2011 as restaurant chef under Ned Bell at YEW seafood + bar, where he brings his knowledge, skill, and enthusiasm to the restaurant’s modern seafood concept. Co-owners and co-chefs Lucais Syme and Adam Pegg have created an exceptional brand in Vancouver, starting with their flagship restaurant La Quercia, renowned for its repertoire of simple, deliciously executed Northern Italian dishes. 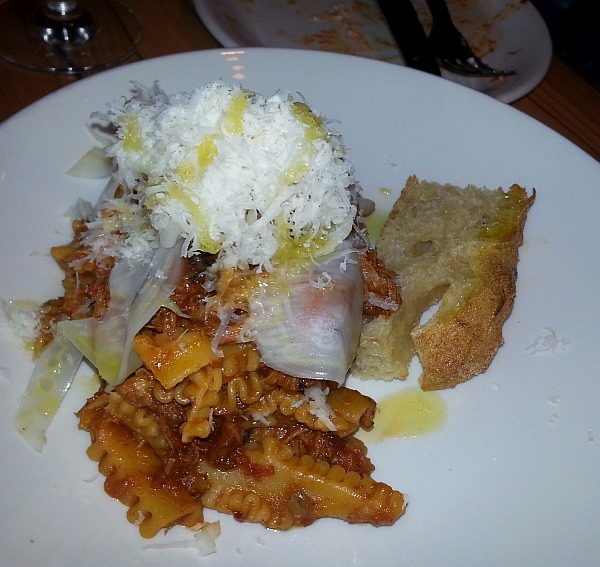 They followed up by opening La Pentola Della Quercia in Yaletown’s OPUS Hotel in 2012 to rave reviews. They also run L’Ufficio wine bar, adjacent to La Quercia. The Arts Club Theatre Company, now in its 49th season, is the largest not-for-profit organization of its kind in Western Canada. Led by Artistic Managing Director Bill Millerd and Executive Director Howard R. Jang, it offers professional theatre at three venues—the Stanley Industrial Alliance Stage, Granville Island Stage, and Revue Stage—as well as on tour throughout the province. 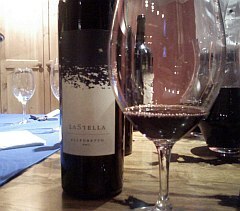 LaStella is the sister winery to Le Vieux Pin in the Okanagan. They produce some very nice wines, and are having a special wine, food, and music paired dinner at YEW Restaurant, next week, Wednesday, June 9. I’m passing this info along to you, as there are still tickets left. The music pairing with the food is also a unique experience! LaStella is situated at Osoyoos Lake in the sunny South Okanagan valley of beautiful British Columbia. Just like music, LaStella likes to names their wine after Italian music notes, such as Allegreto, Vivace and Maestoso. Join LaStella on Wednesday June 9th at 7pm at YEW Restaurant in the beautiful Four Seasons Hotel, Vancouver for a celebration of La Dolce Vita. They collaborated with the culinary team at YEW as well as Mrs. Robin Braun of Vancouver Symphony Orchestra (VSO) to pair each of our wines with a dish and a solo violin piece that captures the essence of the name given to each of their wines. 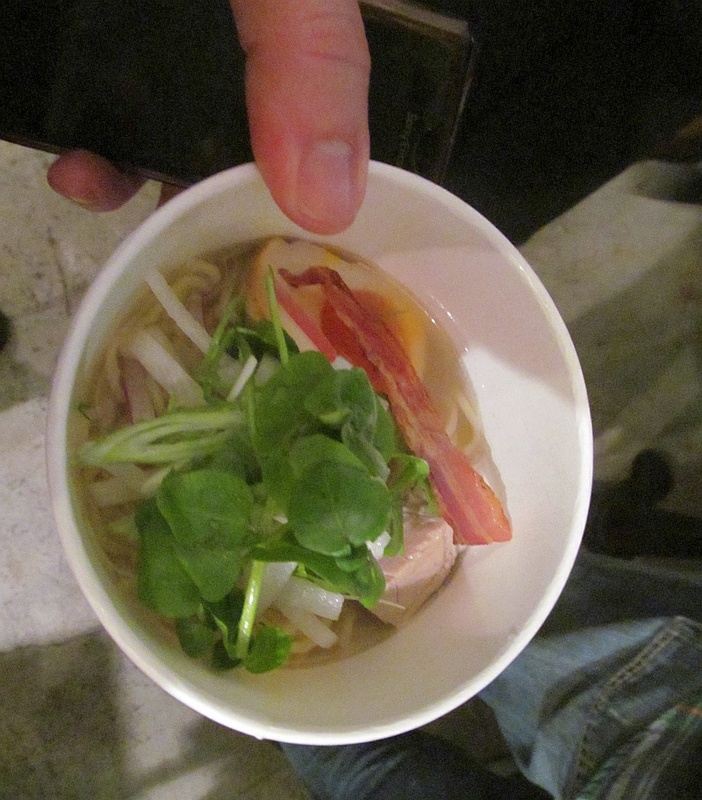 Sometimes I hear about events at various restaurants with food and wine. Here is a case in point. Burnaby’s Hart House is a beautiful heritage home at Deer Lake Park. They have just released their Summer Garden Parties announcement. You may want to partake, and you may bump into me at one of them. Enjoy! Burnaby’s Hart House at Deer Lake is pleased to announce the dates for our summer garden party events. Each garden party starts with a casual tasting of wines from the evening’s featured region, held in Hart House’s elegant gardens. Guests may then purchase wines from the evening’s specially-selected wine list to pair with the al fresco dinner that follows. Live music and a spectacular view of Deer Lake will add to diners’ enjoyment of the evening. Fresh Nova Scotia lobster is the life of our annual Maritime-infused party. Wine sampling and live music help make this event a great way to welcome in the summer. Our classic Italian Garden Party features Mediterranean cuisine paired with premium Italian wines. Guests are welcome to stroll around the beautiful Hart House estate lawn and gardens. This is a celebration of the culture and flavours of Provence , France . A sampling of French wines in our gardens is followed by a dinner featuring Provence-inspired cuisine. California’s world-class wines have earned a prominent place on the world stage in recent years. Here’s your chance to sample some of California ’s best, paired with exceptional cuisine. All events start at 6:00pm. Reservations will be accepted starting May 21, 2009.